From England we moved on to our first country that is actually known for it's beer, Lithuania. The country has a beer history dating back to the 11th century and produces a wide variety of styles of beer. Not just the plain pale lagers I have become accustomed to on my trip so far. My trip to the supermarket in Lithuania was not for many beers as I had been informed the draught selection in Vilnius was excellent, and who doesn't like draught more than bottles? Anyway I still ended up with 5 beers, including my first beer from Belarus. I got some dirty looks for buying Belorussian beer, as cheap beer from Belarus is threatening the Lithuanian craft beer scene. From what I gathered the two main macro beers in Lithuania are Svyturys Ekstra (which I reviewed almost 2 years ago for the European Beer Challenge) and Kalnapilis Grand. 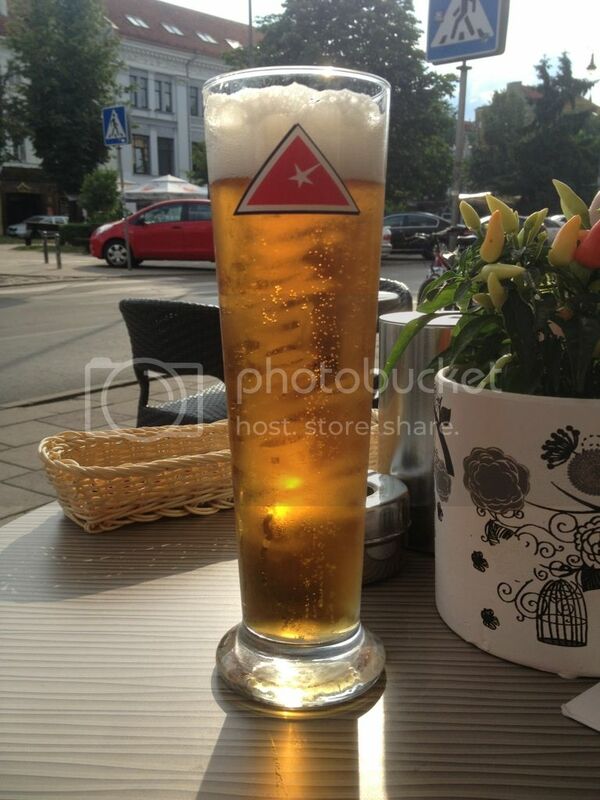 The Svyturys label is easier to find and is at most restaurants and is a good example of a Euro Pale Lager. The Kalnapilis Grand, pictured left, is harder to find but worth the effort. It more of a Pilsner than a Euro Pale Lager and has a heap of hop bitterness for a lager. Having also tried the Kalnapilis Pilsener on bottle I would say that this is clearly the lager that these guys should, and it would appear have, put their eggs in the basket of. Of the two main Lithuanian lagers this would be the one I would have if given the choice. Judging by the number of wheat beers in Lithuania I was not surprised to here that Lithuanian wheat is not only some of the world's best but also plentiful. 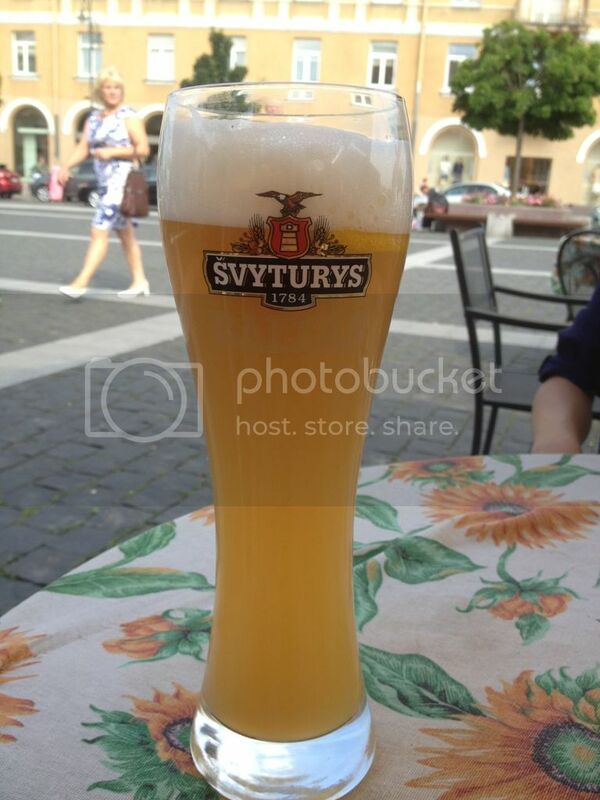 Arguably my most enjoyable beer in Lithuania was Svyturys (pronounced Schver-Tour-ies) Baltas in the Town Hall Square. It was served on draught with a slice of lemon, which added surprisingly well to the flavour. Of the rest of the wheat beers I sampled I think that Vilkmerges Kvietinis probably took the cake for it's spicy malts and good clove flavour. It really was a brilliantly made wheat beer! I don't drink a heap of Hefeweizen's but this is one that if I could get ahold of I would drink alot of, it's very very drinkable. Lithuania is also famous for it's dark beers and I've been craving one for a while. First up I tried Utenos Porteris. Utenos is one of the major players on the Lithuanian beer scene and have produced a mass produced Porter as good as I've had. It had a beautifully creamy yet still thin mouthfeel, which is the characteristic I can most easily recall. 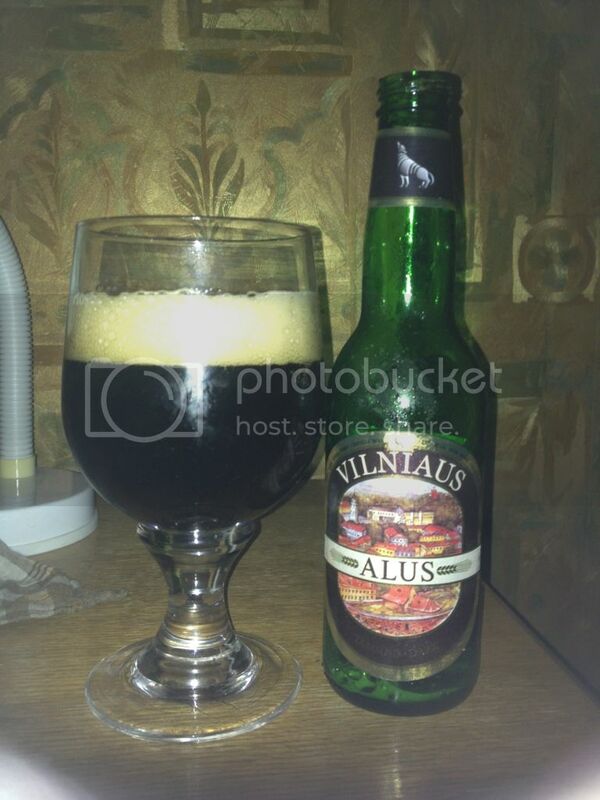 Vilniaus Dark is produced by the only brewery in Vilnius. It's made by a micro brewery with very impressive packaging and an equally high quality product. This beer could be my favourite from the trip so far! Shame I only tried this on my last night in Vilnius or I would have drunk alot more! 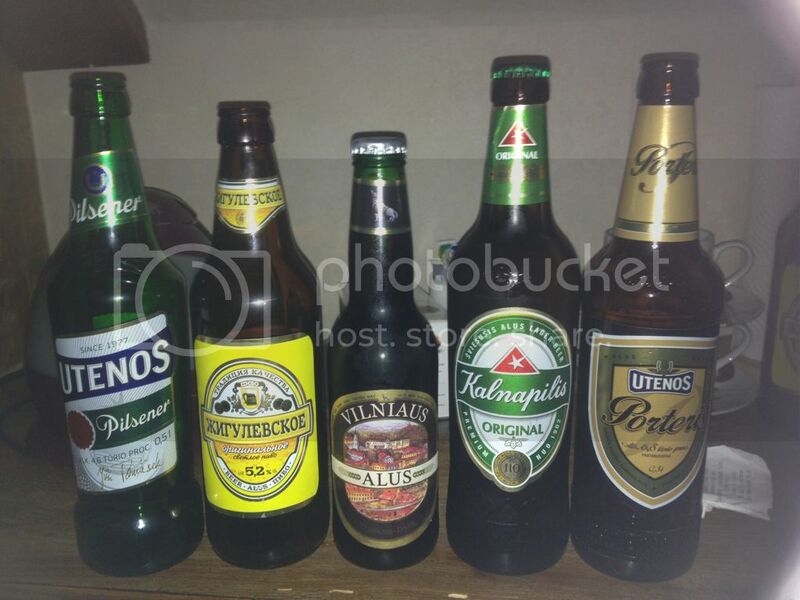 Of the other bottled beers I sampled Utenos Pilsner was a boring macro pils, while Kalnapilis Original was nowhere near the standard of Kalnapilis Grand. You can read about my first beer from Belarus in the European Beer Challenge here. It was great being back in a country that really appreciates beer. While Turkish and Georgian lagers were fine (well Turkey's were not so fine...), there is only so much lager I can drink in a row. In Lithuania the lagers were better, the wheat beers were excellent and there were dark beers. It's a shame we didn't have longer there as I would have loved the chance to check out more. It would definitely be a country I could recommend visiting on a "beer holiday". Limited Lithuanian bottles as Draught range was so good!